Dante’s imprecation ‘Abandon all hope ye who enter here’ seems appropriate for this music; not so much a case of pain and penury as a warning to those foolish enough to attempt it. 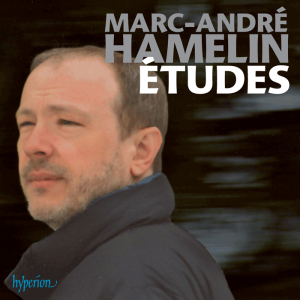 Written and played by the Quebec-born virtuoso Marc-André Hamelin, these pieces continue the tradition of composer-pianists - Liszt especially - skilled enough to play their own devilish creations. As keyboard wizards go, Hamelin is one of the very best; his Alkan is simply astonishing (see review) so there’s no doubt he has the technique, but such exercises can seem relentless if they lack emotional/expressive range. Happily, Hamelin acknowledges this in his detailed liner-notes, where he describes his études as ‘character pieces’ rather than mere pianistic puffery. Composed over 25 years, these pieces mimic a wide range of styles. The Triple Étude (after Chopin) is a good indication of what’s to come, outward urbanity concealing a powerfully individual undertow. It’s a compelling blend of virtuosity and feeling, for which Hyperion provides a warm, natural piano sound. The second étude, subtitled Coma Berenices, is more of a showpiece, the third, After Paganini-Liszt, a witty little exercise in staccato and dragging dance rhythms. This has all the glitter and gasp one associates with its flamboyant forebears, but what really appeals here is the pianist’s abiding sense of fun. It’s seriously good playing, and the fourth étude, loosely titled ‘more of the same’, is a millrace in sound, strong rhythms in the left hand driving the music forward. It really does evoke the breathless brio of Alkan’s work, but then it is based on a contrapuntal combination of two of his pieces. The fifth étude, a ‘grotesque toccata’, must be one of the most challenging thus far, but again there’s enough personality in the playing to make it more than a sterile study. Very different from the fine, filigreed writing of No. 6, a deftly executed homage to Scarlatti. And that’s another plus in this collection; the individual études are arranged to offer maximum contrast in terms of mood and manner, which makes it remarkably easy to sit through all 12 pieces in one sitting. The seventh étude, for example, is different again; subtitled After Tchaikovsky, you’d be hard-pressed to realise it’s for the left hand only. There’s a profound sense of calm beneath those lovely flourishes and quiet bass figures. Indeed, this is a pearl of a piece, perfectly formed and beautifully polished. An excellent example of Hamelin’s skills as composer and pianist, and a piece I will return to with great pleasure. The eighth étude, Erlkönig, is a direct response to Goethe’s original poem and not the Schubert song, although the menacing bass at the start does hint at the mounting alarm that underpins the latter. Generally, Hamelin’s score is not as overtly dramatic as Schubert’s, nor does it have that compelling musical and emotional arch; still, it has a simplicity - an artlessness, if you like - that is most welcome after the highly wrought pieces we’ve heard thus far. As for the ninth and tenth études - subtitled After Rossini and After Chopin - these have already been released on Hyperion CDA67050. One certainly wouldn’t suspect they were recorded earlier, as they are as pleasingly presented as the rest. The Rossinian rush of notes is very well articulated, Chopin’s sound world admirably distilled in the all-to-brief No. 10. The last two études, a minuet and prelude and fugue, seem to inhabit a very different universe, with grace supplanting glitter. That said, Hamelin’s straight-faced baroquerie is shot through with freer, more inventive writing, the stately dance all but forgotten until it reappears towards the end. Even that most formal of genres, the prelude and fugue, is filtered through a contemporary lens; the result is spikier and more extrovert than one might expect, the original tune glimpsed beneath coruscating embellishments. So, a rousing finale that only serves to increase one’s admiration for this most gifted composer-performer. The remaining pieces on this disc are no less alluring, from the atmospheric, rather Debussian, Little Nocturne through to the five movements from Hamelin’s Con intimissimo sentimento. By his own admission, these are not as difficult as the études, but as miniatures they require a delicacy of touch and judicious attention to dynamics. Needless to say, Hamelin has all these qualities, the delicate Ländler I sensitively shaped, the gentle susurrations of Album Leaf - a title well-known in Romantic piano repertoire - suggested by the lightest of strokes. That same poise attends the tiny tunes of Music Box, whose oft- repeated pirouettes have a magnetic charm all of their own; the more expansive After Pergolesi demands a more robust approach, albeit with a subtlety of rhythm, the closing Berceuse curiously becalmed but never dull. And that is another winning feature of this music - it never outstays its welcome. Hamelin has that all-too-rare ability to know when his material has been worked enough, so one is left feeling pleasantly sated. As for the Theme and Variations, its subtitle also has echoes of works dedicated to Cathys past and present. In this case the piece, written for Hamelin’s fiancée Cathy Fuller, has a simply stated theme and four fleeting - but very individual - sets of variations and a concluding Envoi. The pianist may be in a more relaxed mood, but he is just as scrupulous when it comes to rhythm, colour and general finesse. In an age dominated by self-aggrandising performers it’s always a pleasure to hear artists who wear their virtuosity so lightly. There is much to savour, so many strands woven into works of skill and substance. Marry that with lucid, self-deprecating liner-notes and top-notch sound and you have one of the finest piano records of the year.